There are many reasons to look forward to cold, snow-covered days. They are great excuses to “rest” after a busy gardening and beekeeping season; it’s a good time to catch up with reading and I enjoy a cup of tea curled up in front of a fireplace with a purring cat in my lap. There’s one other reason and one that is part solving a mystery with a dash of fresh discovery. That is walking through my snow-covered garden and spotting the different foot prints in the snow, which confirms my regular visitors. Although I can’t tell the difference between the different winter birds, those foot prints are the easiest and most fun to follow. In the following photo, can you find the deer print? As much as the individual foot prints are fun to follow, I like to find the intersection of prints and try to imagine what happened at that point. When I watch my garden from inside my house, I sometimes spot birds running into each other and squirrels chasing each other through the garden, even in snow. 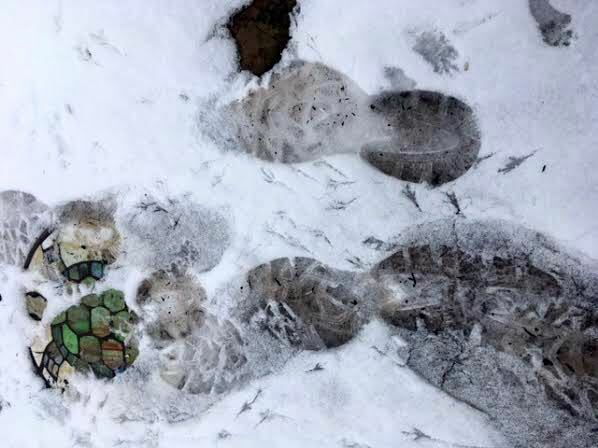 Their combined foot prints, however, don’t mean they were in the one spot at the same time. Let’s see, I see squirrels, birds, rabbits and maybe raccoon prints in this spot. By checking the foot prints, I have also found some interesting trails. I didn’t know some of my birds like to winter over some of my hydrangea bushes, or how much many of these creatures circle my small front pond. Seeing those foot prints inspired me to make more of an effort to give them water in nearby bird baths. Being outside after a snowfall is also quite quiet and beautiful, completely changing the look of my garden covered in a blanket of snow. If you haven’t had a chance to walk through your garden after a snow storm, do it safely if you can but give it a try. You may be surprised at what evidence you see of what is visiting your garden! March is the beginning of daffodil days in my garden, a wonderful almost daily parade of new flowers that can distract me from getting things done but doesn’t stop me from garden dreaming. The weather can also be a little challenging in USDA Hardiness zone 5b so March is a hit and miss month in terms of getting a lot done but I still have” must do” chores. 1. Prune and fertilize roses. 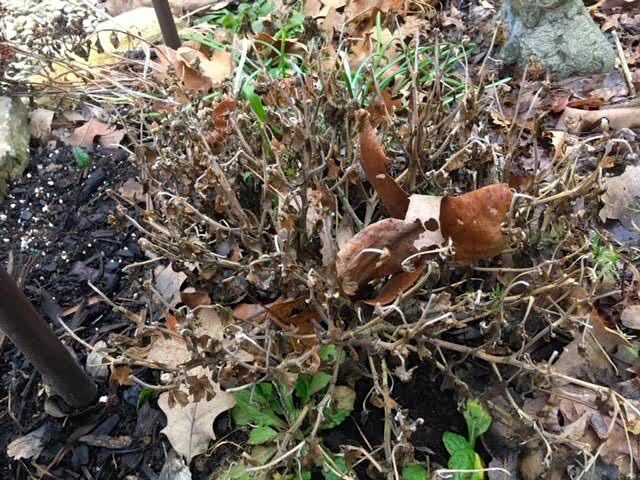 On the first warm day, I remove all dead branches so the new growth will have room and add coffee grounds, banana peels, Epsom salts and crushed egg shells mixed into the soil around the base of the plants. Gently, you don’t want to tear up the roots. Also a good time to mulch. 2. Plant onion sets around roses to keep bugs at bay. Three for miniature roses, 5-6 for the larger roses. 3. Prune fruit trees. Nothing elaborate, I make sure the branches don’t cross and are open in the center. Also mulch. Make a tire around the base leaving the space up at the tree trunk open. 4. My hellebores and ‘Autumn Joy’ Sedum get the old greenery cut off so any new growth gets to shine. The Sedum starts look like tiny green roses. 5. If I haven’t already painted and repaired birdhouses and native bee houses, those get finished and installed this month. If I put this off much longer, possible renters, especially birds tend to pop into the garage to check out the real estate before it’s moved out into the garden. 6. Mulch. My over-wintering mulch pile is ready to spread over new areas that need cover for the season and areas that lost cover over winter. Good time to load up the wheelbarrow and keep a supply at hand. 7. If you didn’t get your lettuce and spinach out in February, get them planted this month. I started a crop in my pot garden mid-February. 8. March and St. Patrick’s Day is also the time to plant potatoes, radishes and carrots. 9. The last frost day for this zone is Mother’s Day in May so it’s a little too early to get much else planted and much too early to move tropical plants outside, even if you are ready to toss them out on their aggravating dropping leaves by now. Give them a little rainwater and that will help tide them over another month or so. 10. Also check inside plants for bugs. Look under leaves and if you see white bugs, clean off with a damp cloth wet with water and dishwashing liquid. Also spray soil with a few drops of dishwashing liquid in water in a spray bottle to get rid of eggs in soil. Start watering with ¼ strength fertilizer since days are getting longer. They are as anxious to get outside as you want them to be outside, I am sure, mine seem to blossom within a week of hitting my deck. Most years in fall, when spring bulbs are on sale, I pick up a few bags and make bulb gardens to share with friends mid-winter. Usually by early to mid-February those of us who live in Missouri are more than ready for spring and a little bulb garden offers the promise of more flowers to come. This past year, I used crocus, small daffodils and tulips in my bulb garden, the bulbs layered so their roots could get nourishment as they grew. After watering and covering the bulbs with new potted soil, I wrapped them in a metallic wrap and placed them in a refrigerator to chill for 3 months. Once the tips started to show, I started to pull them out and share as gifts for Valentine’s Day. Usually the crocus bloom first, followed by the daffodils and tulips. Once warmed up, it doens’t take the bulbs long to get growing. I place them in an area where they can get sun but not directly, and away from heat sources so that the heat doesn’t dry out their soil. My crocus have bloomed in my pot, now waiting for the daffodils and tulips. Another way to bring on an early spring is to add a floral quilt on your bed, like Pink Applique Tulips. These tulips last as long as you have the handmade quilt on your bed and no watering required! Sometimes I feel like I’m living in an animal house, or at least in the middle of a zoo. Being a National Wildlife Federation certified wildlife garden, I do encourage wildlife to feel comfortable in my one acre limestone hillside garden. There are small ponds for water. 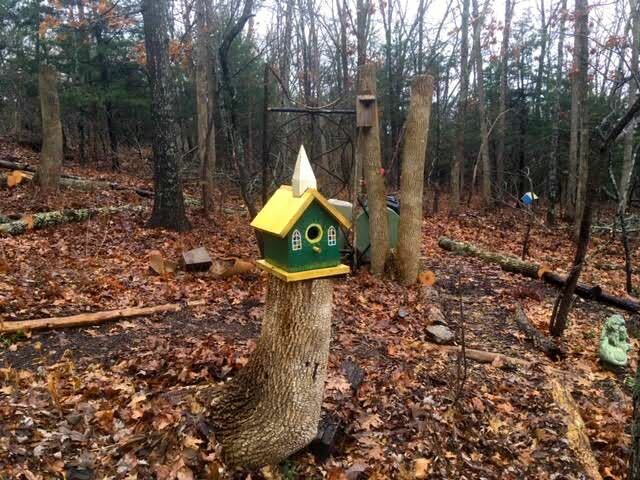 Bird feeders with a variety of treats and oak trees comfortable enough for homes. One such tree is located outside my den. I can see it from the house and often start my morning looking at it out of my den windows. Over the years, hand-raised Robins have serenaded me from those tree branches. I have had an owl perched on one of the top branches and, most recently, watched a squirrel nesting. Squirrel nests in Missouri are easy to see, especially in winter. With leaves off trees, the pile of nests are easy to spot. Most tend to be built towards the top of trees, at least in my garden. My best guess is this is the largest of the 4 native Missouri squirrels. The fox squirrel, also known as the eastern fox squirrel or Bryant's fox squirrel, is the largest species of tree squirrel native to North America. It has very sharp claws, a muscular body, and a long, fluffy tail. The most common fur color for a fox squirrel is reddish-brown, but color can vary greatly from overall pale gray to black with white feet. The fur on its belly is always lighter in color than the rest its body. Often a fox squirrel will have reddish hairs tipped with brown. These animals are most often found in forests with open understory, or in urban neighborhoods with trees. They prefer to live among oak, hickory, walnut and pine trees, storing nuts for winter. They shelter in leaf nests or tree dens, but will sometimes make an attic their home if they find a way inside. This particular morning we were enjoying a sunny day with temperatures a little warmer than usual. As I peeked out of my den window, there was a squirrel, also enjoying the warm sunshine. Grey squirrels are frequent visitors to my garden. This one has apparently decided my garden is a good place to nest. And rest! We’re in the throes of another cold spell, wind chill below zero and everything around me frozen solid. Our big box stores, however, are offering onion sets, asparagus starts and Iho Peonies so spring is just around the corner. Pressure is on so if you haven’t made a dent in your reading pile, get a start, spring is only two months away. With our rapidly changing and more erratic climate patterns, the forecast is for an earlier spring. So also says the groundhog. If you haven’t ordered your favorite gardening catalogs, get them ordered. Look for catalogs with detailed plant descriptions and good photographs so you can use them for reference. Missouri Wildflowers Catalog has lovely pictures, even old catalogs are still good references. www.mowildflowers.net. For heirloom seeds, try Baker Creek Heirloom Seeds at www.rareseeds.com, both are Missouri nurseries. Review last year’s garden diary entries. If you’ve missed a few entries, add them now. Underline items you wanted to get done this year. I make a list, then decide which projects I want to tackle. I also carry over the ones I didn’t get to last year, or drop them off the master list. This is a good time to dream. Focus on adding native plants. Once established, they will be low care and tend to require less water than other plants and they will feed the native pollinators. They are connected. Read. Whether it’s Missouri Gardener Magazine, which provides good local gardening information and gardening books, catch up on what you couldn’t get to last year. I keep a pile of gardening books from our local library’s semi-annual book sale just for snowy, cold winter days. On warm days, remember to water mums planted this past year. New mums need a gallon a month to keep their roots moist their first year. Once established, mums will become perennials and deter bugs from around where they are planted. 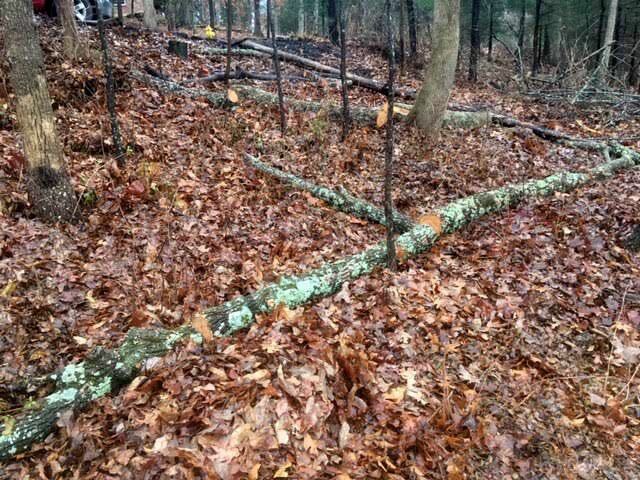 Remove any broken limbs in pathways to keep walkways clear and safe. Pile mulch and leaves on garden beds if they’ve been blown off by winter winds. Check inside plants for any hitchhiking bugs and remove. Make sure they are getting their sunlight needs met. If not, move them. Water with diluted fertilizer. Prune as necessary. Drop your garden pruners and other garden tools off to get sharpened, this is a slow time of year and this will give you a head start on the season. When feeding birds, add a little sand in the bird feeder mix. Birds need sand to help them digest seeds. Also ensure they have an available water source. Feed suet on cold days. If you have fish in an outside pond, make sure it has a hole in the ice so fish will get oxygen. A typical bulb garden in a tapered pot. Is that the right pot to choose? Bulb gardens are popular as gifts mid-winter. For years I have made bulb gardens from fall sale bulbs and tucked them into the back of my refrigerator 10-12 weeks for the bulbs to get the chiling they need before they start to grow. Depending on when I made them, I start pulling them out mid-winter. 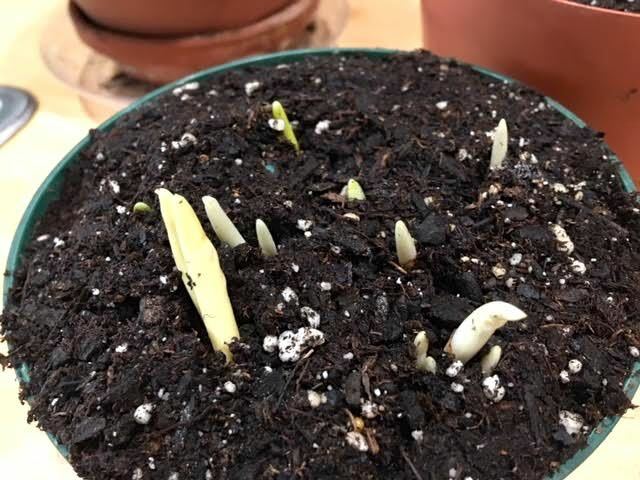 Just as another winter storm is in the forecast, the green tips of little bulbs promise spring is not too far away. When planning to plant anything, and here I am using the bulb gardens as an example, the size of the pot is important. You want at least 2 inches of new soil around the roots so the roots can take up nutrients and feed the plants. Especially when planting tulips, you also need a longer pot so the tulip greenery doesn’t fall over. t’s easy to pack too many bulbs into the wrong-sized pot, which I did with one of the bulb gardens this year. See the white roots peeking out of the bottom? I could tell from seeing those roots I was rusty in making my bulb gardens but luckily it was relatively simple to fix. I selected another, larger pot I could use to transplant the original bulb garden. To make sure the bulbs were not impacted, I cut the original plastic pot off the roots after ensuring the bulb garden would nicely fit in the larger pot. The same concept applies for whatever you want to plant this next growing season. Often when we buy plants in pots they’re jammed full of plants that can’t survive in such cramped quarters because there is not enough nutrients available through the soil. If you want to buy a hanging plant full of flowers, check to see how many plants are in the pot and make sure there are at least two of each. Then buy a second empty pot with soil and make yourself a second hanging pot, giving your plants more room to grow. It may take a little time for the plant roots to establish themselves in the second pot but you will have longer-lasting plants and more blooms if their roots have enough nutrients. And yes, you can fertilize but that’s only going to last so long. Artificial fertilizers forces the plant to grow too fast. As soon as any hot weather impacts the little soil already in the pots, the plants will die for lack of both water and food. And what about the pot for the bulb garden at the top of this story? It’s pretty and appropriate for the bulbs in the pot, crocus surrounding the outside and tete-a-tete daffodils in the middle. The daffodil roots will grow longer so they need more soil under them. The crocus are shallow so don’t need as much soil. If I had my druthers, though, I would give all those bulbs more root space so they can stay healthy during their growth and I can pop them outside in my garden for repeated growth later. I have a new contender for hardiest as well as most useful border garden plant, liriope muscari, also known as monkey grass. Over the years, I have used this flowering perennial to line garden paths. Not only does it easily adjust to most soil conditions but it blooms August-September when little else in the garden is blooming. The light lavender flowers remind me of tiny grape hyacinth flowers, which explains the “muscari” in the plant name. I found this latest bunch of monkey grass abandoned by the side of a road close to where I live. I recognized the tufts of thin leaves on top of the root clumps and happily brought them home to line my new garden paths. A few weeks later, I started to find little plant groups pulled out of the ground and sitting in my paths. After a closer look, I found most of the plants trimmed to the ground by, I suspect, my resident deer. The ones pulled straight out of the ground had not established their roots yet so they could not fight off the hungry marauding visitors. When the record-breaking cold polar vortex with snow hit mid-Missouri, it crossed my mind I should go out and check for any errant monkey grass pulled out of the garden. I waited until temperatures were in the 30s before making the rounds and found 3 groups of plants sitting in paths, their roots frozen but still pliable. Once inside, I gently poured room temperature water on the roots and placed them in a pot to thaw out. According to the Missouri Botanical Garden, monkey grass is easily grown in average, medium moisture, well-drained soil in full sun to part shade. Tolerates a wide range of light conditions and soils. Will grow in close to full shade, but will produce more elongated foliage and spread more slowly. Also has good tolerance for heat, humidity and drought. As you can see from the plants I brought inside, the leaves hold their color for a good part of fall and winter, finally dying back until new growth appears in spring. Some people cut it down. I have my own mowing team that trims the foliage back to root level so I don’t do much with the plants over winter. Liriope muscari is also commonly called lilyturf or blue lily turf. It is a tufted, tuberous-rooted, grass-like perennial which typically grows 12-18" tall and features clumps of strap-like, arching, glossy, dark green leaves (to 1" wide). Clumps slowly expand by short stolons, but do not spread very fast. Lavender flowers give way to blackish berries which often persist into winter. The genus name honors a Greek woodland nymph, Liriope, the mother of Narcissus. Other common names are border grass and monkey grass. Here is one of my garden paths bordered with monkey grass. The plants soften the paths and provide a nice green line during most of the growing season. When it blooms early fall, it also provides a source of pollen for my bees. As far as the three plants I brought inside, they get planted into a pot tomorrow to winter over in my living room until I can safely move them back outside. As you plan your garden for later this year, add this plant to your list of border plants. They will be a nice addition to your garden and not require a lot of work, unless you find them out of the soil frozen mid-winter. Considering their history, I think pulling them through the rest of winter is the least I can do! Summer in the Midwest can be a lovely riot of color. By mid-winter, however, I miss the Missouri wildflowers and perennials that usually keep me company on my hillside. To brighten up my winter and for my early January birthday, I splurged on three Apple Blossom Amaryllis bulbs to add to my already existing collection. Yes, I have picked up a few of these fun bulbs in the past, most certainly to celebrate other birthdays. The Amaryllis bulbs where on deep discount after the holidays, which is a great time to buy them. As I was picking my Amaryllis bulbs, a lady stopped by and asked for help picking one out as a gift for a friend. Usually by this time of year Amaryllis bulbs have bloomed in their box or not quite started. Those that bloomed were exposed to some moisture, which triggered the blooming. They will need to be potted, allowed to grow leaves and then encouraged to rest a couple of months before they bloom again. This is how you usually see Amaryllis bulbs right out of the package. If you don’t see any Amaryllis flower buds or leaves, pick the largest Amaryllis bulb you can get. The larger the Amaryllis bulb, the more energy is stored and the higher the chance that the Amaryllis bulb will produce a flower. Here is another Apple Blossom Amaryllis bulb in bloom with the start of another flower stalk coming out of the bulb. This Amaryllis bulb was already trying to bloom when I bought it on sale. The Amaryllis flower bud quickly makes its way on top of a green stalk, growing to almost 2 feet before it blooms. I usually have to stake mine along the way to prevent the weight of the flowers from knocking the plant over. Amaryllis bulbs are native to South America. They can spend summer outside to build up energy in their buds before being moved inside for midwest winters. One of the delightful surprises is to find Amaryllis bulbs blooming mid-winter. I don’t always see the buds as they are growing but it’s impossible to miss the lovely flowers! If there was one book my grandmother sent me for Christmas that had the most influence over the years, this is it. The 1961 Complete Guide to Garden Flowers used to sit next to my bed for years, the favorite book to peruse as I was getting ready to sleep. That turned out to not be such a good idea since once I started, I could spend hours browsing through the 1,000 illustrations and flower planting guides. I didn’t choose to live on a hillside but the photos of spring bulbs on a rise sure looks familiar during springs now in my garden. The photos were a definite draw. What was even better were the detailed descriptions of flowers and their growing requirements. Six horticulturists contributed their expertise as book editors, which explains why this vintage gardening book still holds its value. I know it’s easy to think that everything one needs to know is available on the internet but that’s not true. These older, vintage gardening books reflect a different time but still offer valuable information on how to successfully grow plant varieties. As our climate continues to rapidly change, we will continue to lose species and these old books will also document varieties that we may no longer have. If you’re looking for a gift for gardener who will enjoy this book, we have one edition in excellent condition for sale. No, it’s not my original one, I have that one happily in my library in a place of honor next to my Grandmother’s photo. I have a feeling she knew what she was doing when she sent me that book! Winter seems to be a quiet time for gardeners but there are several things one can do. One of the more challenging things to design in a garden is a network of paths. If you’re working with a brand new piece of property with nothing growing, that’s one thing. However, most of us have at least a house and some form of growth be it trees or shrubs, or both. If you have any kind of incline like I do, it’s almost impossible to keep the paths once you build them so adding structural support is a must. You can buy software programs where you can plug in your land dimensions and even photos. Those programs, however, don’t easily adjust for garden terrain. One easy way to determine where you should put your paths is an ice storm. Freezing rain, sleet and ice will settle on the ground and help define the low spots. It’s how I have developed and confirmed my garden path network. The flat garden areas are easy, such as around the front of my house (photo above) and small pond. As I move to the hillside, the ice helps to show me the garden path network and how accurately I developed them earlier in the season. This corner is on the south side of my property leading to my southern bee garden. Some of these paths have been around for a couple of decades. The path on the left was build new last year. The oldest garden path is in a center island as one enters my property. It’s off center compared to the rest of the garden paths but it was the easiest place to build one at the time. Every year I consider whether I want to move the path and so far, have left it. The northern apiary has a better developed network of paths. Most of these paths were built this past season and with one exception where I need a small tweak, this side of the garden is now easy to access with flat garden paths. After lining the path with downed trees, I add cardboard then mulch until the path is level. Or as level as I can get it. Don’t tackle the ice to get photos but if you can take some safely it’s a good time to document your garden path system before snow covers it all up. When we’re close to the ground it’s hard to guestimate where a new path should go. The ice and these photos will give me a blueprint for next year. Now to start dreaming about what I am going to plant! It’s true, I’m a bit picky about my gardening trellises. I want them to be interesting but not so interesting to take away from the flowers growing over them. I also prefer something less than hard edged industrial, which tends to be the main options. 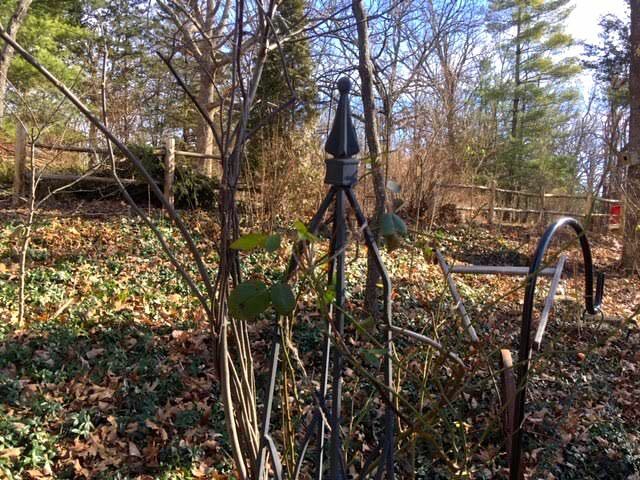 This year, I am trying something new - repurposing native Missouri cedar branches into fruit fences, flower bed arbors and now rose trellises. I was inspired by having this black metal rose trellis on one side of a garden path. To balance out the area, I needed another trellis on the left side. A cut down ash tree stump inspired me to encircle it with cedar tree limbs tied at the top about the same height as the metal rose trellis. At first I thought I would finish the trellis by getting a metal fence post for the top but leftover cedar pieces cut smaller give me the same pyramidal top. Remember this structure will be entwined in rose vines next spring so very little of it will be visible once the vines start growing. I thought I was on the right path when I had to move the existing rose vines out of the way to install the cedar limb trellis. Once growth starts, the vines should get the support they need and nicely cover the cedar limbs. Cedar limbs are not only native but they are long-lasting and I can easily add more if I need them. I still have some cedar limbs left so next I am making a larger arbor to cover the bench in my berry patch. That one is going to have to wait until after the snow storm passes and melts. Looking at the cedar rose trellis in the snow beside the metal one, I think this will work quite nicely, don’t you? 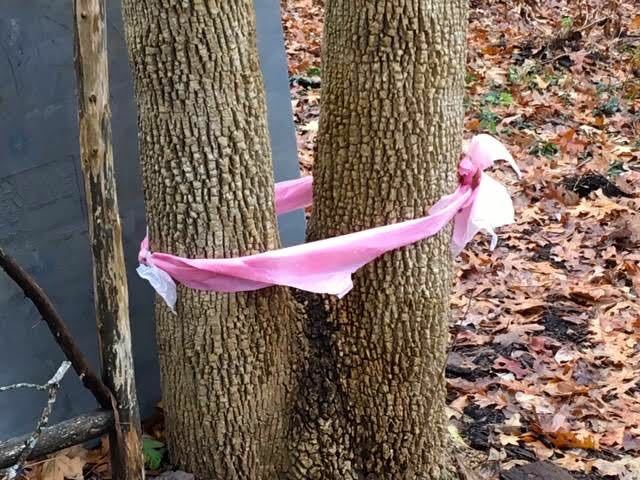 I was getting excited about a winter snow storm forecast when I remembered one of my garden projects was only half done: my cedar branch fruit fences. The problem was that the cut down cedar branches were now piled in front of my garage door, keeping a couple of visiting rabbits warm and my car from getting safely stored away before the storm moved in. Luckily this was not a difficult project to finish so I bundled up, plugged in my nail gun compressor and got started making the actual fences for some of my raspberry and blackberry patches. If you do a search for these berry fences, you will find some very serious-looking set ups with wire and industrial end supports. My idea is more user friendly. I want to be able to walk through my garden paths and easily pick the berries off the nearby vines. I also didn’t want them to look like prison walls like some do so I chose to make smaller fruit fences out of cedar branches. Cedar is long-lasting, the newly-cut branches are easy to shape and with a little creativity, I can make fencing that will also be attractive to both fruiting vines and garden visitors. Knowing that raspberry vines like to move, my first cedar branch fence was for a newly-established raspberry area so I can try to corral the raspberries. I know, a lost cause but it at least marks where they are and guides me away from the thorns. The plants can spread towards the back and any that make it into the patch can be easily moved. The fence lengths, about 5-foot long each, also have cedar branches that form arches so the fruit vines can easily wrap around the bending cedar branches. The bottom, more straight rungs will also contain vines and still make them easily accessible. I’m thinking for me but I’m sure the deer and birds will more easily find them, too. Once these branches start to grow, I can then trim the plants at the bottom of the cedar branch fence without getting entangled in the thorns. Well, at least that’s the theory. Another fruit fence was made for a thornless blackberry growing beneath one of my hives. Last year, the plant seemed to be trying to grow into the hive so I am hoping the cedar branch fruit fence can keep the vine better behaved and still give my bees access to the nearby nectar and pollen. There are a number of pre-made fencing available on the market but they all look way too industrial for my garden. They also assume one is installing them on a flat surface, not a limestone hillside where to get any depth one would need to dynamite. These cedar branch fruit fences will fade as the growing vines cover them and I can use cut down cedar trees from my garden to make them. That’s a win-win in my garden book and now I can get my car into my garage. Ok, snow, bring it on! January is the one month when a gardener can sit back and do some of the most important work: planning. Our rapidly-changing climate is challenging the traditional gardening chores so this year I will be including more recommendations on how to prepare for our changing growing conditions in USDA Hardiness Zone 6A, formerly USDA Hardiness Zone 5B. 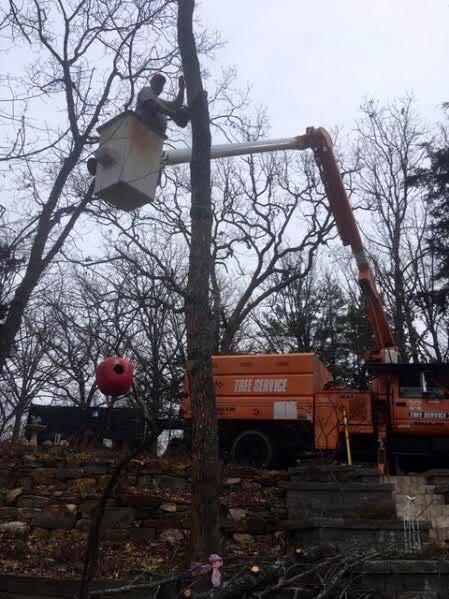 According to US Department of Agriculture, the Hardiness Zones are based on the average annual minimum winter temperature divided into 10-degree F zones, which give a range of temperatures for a certain plant or tree. The hardiness zones for the Midwest fluctuate more than other zones but average Zones 4,5 and 6. 1. Review your garden diary from last year. Underline items you want to get done this year. I also carry over the ones I didn’t get to last year, or drop them off the master list. This is a good time to dream. 2. Identify what plants you want to add this year and note what soil and sun requirements they will need. Focus on adding native plants. Once established, native plants will be low care and excel in local soil and weather conditions. 3. Plan on expanding flowerbeds to start removing grass from your property. Expanding flowerbeds will give you areas to plant vegetables as well as flowers and provide more food for pollinators. One way to start expanding flowerbeds is to place cardboard along the existing flowerbed edge and then move the flower bed border early spring. Mulch on the cardboard will keep the garden looking nice and help restore healthy soil conditions. 5. Order locally-adapted seed catalogs. Baker Creek Heirloom Seeds is a favorite seed catalog from Mansfield, Missouri. www.rareseeds.com. 6. Read. Whether it’s Missouri Gardener Magazine, which provides good local gardening information and new gardening books, catch up on what you couldn’t get to last year. 7. Remove any broken limbs in pathways to keep walkways clear and safe. 8. Don’t walk on frozen lawns. 9. On warm days, pile mulch and leaves on garden beds if they’ve been blown off by winter winds. 10. Check inside plants for any hitchhiking bugs and remove. Make sure they are getting their sunlight needs met. If not, move them. Water with diluted fertilizer. Prune as necessary. 11. Drop your garden pruners and other garden tools off to get sharpened. 12. Start scouting where you can install rain barrels and totes to collect rain water off your gutter system. 13. Push heaved plants gently back into soil. Make sure to add mulch around these plants. 14. Water newly-planted chrysanthemums so they can get their roots established. I know, it sounds odd to be saying to go out in the Missouri winter cold to water a plant but if you want newly-planted mums to survive, their roots need moisture until they can get established. Mums have for years been a traditional fall plant to add to a garden for color. Unfortunately planting them that late does not give the plant roots enough time to establish themselves before cold weather arrives. Established roots can go dormant and reappear the following year, which is what happens once mum roots are established. To pull mums through their first winter, plan on making sure their roots stay hydrated through the cold season, which means watering them a couple of times a month. If you get rain or snow that soon melts, nature is watering them for you. If this mum has been kept hydrated since I planted it, it should have some new growth peeking up through the dead branches. Leave dead branches on the plant, they provide young plant starts protection from the elements. Looking through the dead branches to soil level, especially towards the center of the plant, you will see plant starts. Can you see the new growth underneath? I have been watering these mums every week or so since the mums were planted last fall. Once the mums start growing in spring, I will cut away the dead cover and gently break up sol around the base with my claw gardening gloves so they can more easily grow. It’s amazing how these little starts will quickly grow into spring plants given half the chance. Once they make it through this winter, these mums will return on their own for several years without having to be watered through winter. Darwin Hybrid mixed tulips in bloom spring 2017 in my new driveway retaining wall. Tulips are planted in fall but most people think about planting them when they see them in spring in bloom. And yes, you can move tulips in spring, I will get to that in a minute. Purchase tulip bulbs that are large, firm and heavy. Store the bulbs in a cool, dark place until planting time. You can usually find them for sale early fall at most garden centers, or through a variety of online suppliers. Plant tulips in mid to late fall, when you are raking leaves and doing other fall clean up chores. Soil temperature should be 55°F or cooler. Choose a planting location with full to part day sun, where the soil is well drained and easy to dig, never soggy. Loosen the soil to a depth of 10”. Also think about what wildlife may be in the area. Tulips are a favorite snack for deer and rabbits. Mice will eat the bulbs when there are mole runs. If you have a lot of moles, plant tulip bulbs in soil in pots and bury the pots in the ground covered with chicken wire to protect them from being a winter snack. Tulips look best when they are planted in informal groups of 5 or more bulbs. 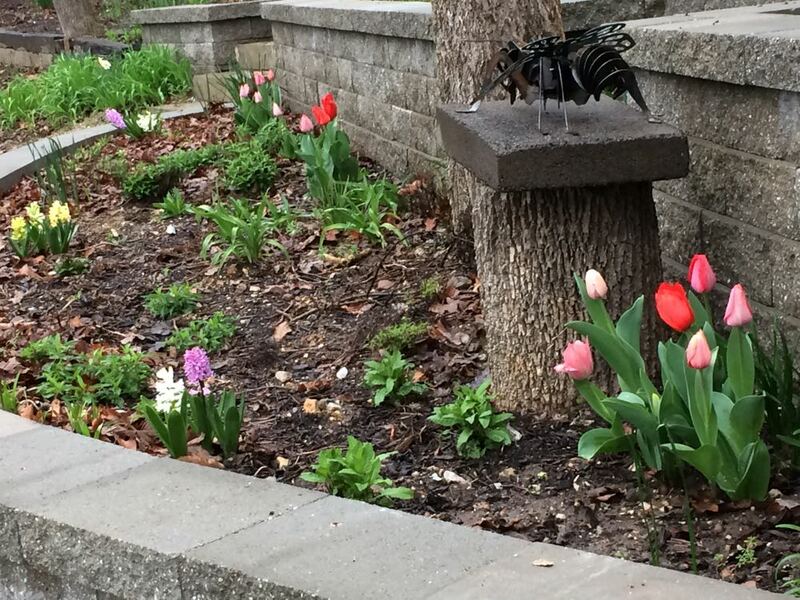 Groupings of odd-numbered bulbs seem to look better than even numbers but I have planted, and like both groupings. Space the tulip bulbs approximately 3 to 4” on center and plant them 6 to 7” deep. Use a garden trowel to plant individual bulbs or remove the soil from the planting area, place the bulbs and then refill the hole. I invest in bone meal and add a sprinkling in the bottom of each hole before adding the bulbs. Bone meal provides a boost to the bulb roots as they start growing and makes sure they are strong and healthy when they are ready to bloom. Because people fall in love with tulips in spring when they are in bloom, there is a tendency to want to move them in springtime, too. Although I don't recommend moving spring flowers in spring, it can be done. Dig the soil around the tulip roots and move tulip bulbs and soil to the new growing location. Do not dislodge the soil around the tulip roots or you will deny the plant the ability to gather nutrients and you will also disrupt the growing cycle. Once moved, water well and, if necessary, stake the flowers so they will stand. I have found that once moved, it will take the flowers about a week to settle into their new home and stand up on their own. The bulbs may not bloom the next year but if they are a re-blooming variety, add compost through the fall to re-invigorate the bulbs and they should bloom the following season. It’s been said that various colors of tulips have significant meaning when gifted: Red means love, white means I’m sorry and purple represents loyalty. Some of these "messages" are similar to the meaning of similar colors in other flowers, such as roses. Regardless of the tulip variety, they are lovely flowers and deserve a safe spot in a spring garden.